Energy and the Future | Blah! One of the biggest challenges for our planet is energy. As more countries become industrialized and the people of those countries become more wealthy, they will need more energy. The problem is compounded by things like global warming, where we have to be careful how we get our energy. We can’t just burn fossil fuels indefinitely, we have to think of other ways of supplying our energy needs. About a month ago, a colleague gave a talk at work on an energy workshop he attended. All of the talks from that workshop can be found at http://rael.berkeley.edu/files/apsenergy/ but my colleague gave a nice overview of the workshop and I thought I’d share some of the highlights here, as I think that both they were very interesting but also because I think this is such an important topic. The scientific consensus is that there is at least a 9/10 chance that global warming is due to green house gases released by human burning of fossil fuels. Thus, future generations will need to find cleaner ways to produce energy. They will need much more energy than we do. If you look at trends in energy use vs per capita GDP, there is a direct correlation: as nations grow wealthier, they use more energy. The world currently uses about 15 terrawatts of power. It is estimated that by 2050, assuming there are 9 billion people then (as opposed to 6 billion now), the world will need 50 terrawatts. If everyone used as much power as the average US citizen, 9 billion people would need 100 terrawatts. We currently use twice as much power per person as Western Europe and nearly 30 times as much as the average Indian. There are two main ways to mitigate energy shortages: government regulation and make more energy. In the US, because of the decreased value of the dollar, we effectively pay $1300 more per year for oil than Europeans. Government regulation can help mitigate energy use and even lead to better products. 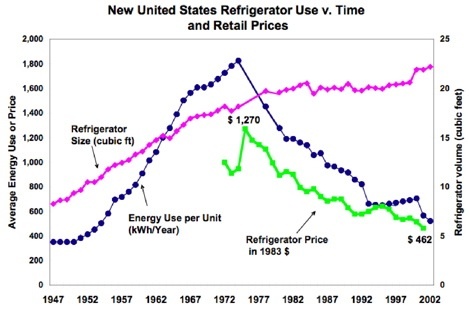 Over time, refrigerators became cheaper (green curve) and larger (purple curve) while also becoming more efficient (blue curve), which reversed the previous trend. As a result of these and other regulations, California energy use per capita leveled off in the 1970s, while it has continued to rise in the rest of the US. A similar experience is seen in car performance as a result of CAFE standards. Overall fuel economy has increased, while horsepower also increased and acceleration time has decreased. Some vehicles are excepted from CAFE standards, as they are viewed to have other advantages. Examples are SUVs which are thought to be safer. However, the overall risk of some fatality, to either the driver of the SUV or the other cars, is higher for SUVs than smaller cars. More efficient use of energy will also help. Better system designs (such as radiative floor heating and radiative ceiling cooling) can lead to 50-85% energy savings. But you have to be careful. Electric cars are more efficient than gas powered cars, until you consider the source of the electricity. If it is a coal fired power plant, is it more efficient? There are many sources of energy, of various renewabilities and cleanliness. Solar includes light, wind, biomass, tides, as these all ultimately convert solar energy to electricity in someway or another. Solar from light costs about 2-3 times as mainstream sources right now. It is difficult to build large-scale solar farms as, after you exclude areas with low light intensity, environmentally sensitive land, too steep of land, and non-contiguous land, there isn’t too much land left. Wind-power is best on coasts where wind speeds are high. This also correlates to high population areas. What can we get from each (remember, we need an additional 35 terrawatts by 2050)? To solve the problem will require many large scale efforts. 2 billion cars at 60 mpg instead of 30 mpg. 25% reduction in electricity use in homes and businesses. CCS (carbon capture and sequestration) at 800 GW coal plants. 80×100 square miles of photovoltaics (e.g. on house tops). 80×100 square miles of concentrated solar power (solar farms). The size of the problem is enormous and demands immediate action and investment. Previous PostWhat the?Next PostWho is doing the lying in Obama’s Lies? Try my view of an all electric future at http://gt-mhr.ga.com on the link to Fission and Fusion. Much agreement and several surprises. I was lead to believe that the world energy usage was closer to 4 terrawatts per annum at current levels than to the 15 terrawatts that you proport it to be. Exactly how did you arrive at your figure? If there is this much discrepency between what I have been previously told and what you are now telling me I would be interested to find out which figure is the more reliable so that I may get a real idea of what the global renewable energy landscape is likely to look like in the future. The presentation I saw referenced this paper (http://www.mitpressjournals.org/doi/abs/10.1162/daed.2006.135.4.112?cookieSet=1&journalCode=daed) for that figure, which I don’t have full access to, but the bit available there gives a similar figure. Unfortunately, it is just quoted there. So, Wikipedia, which isn’t always the most reliable, quotes, in this article (http://en.wikipedia.org/wiki/Energy_consumption), also a number of 15 TW, which they say comes from the US Energy Information Administration’s 2006 estimate. I wonder if the 4 TW you saw was a subset of consumption? On that Wikipedia page, they show a breakdown and either oil or coal individually come in at about 4 TW? But, the 15 TW figure seems to be pretty solid to me.